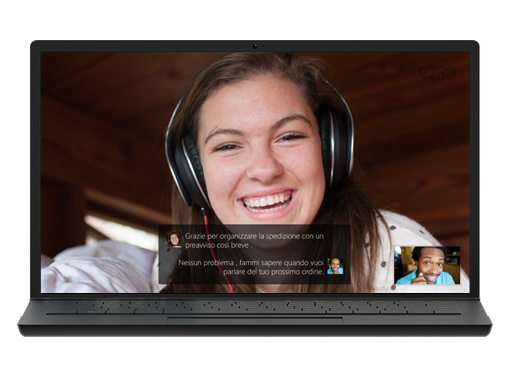 Whether you need to translate English to Spanish, English to French, or communicate in voice or text in dozens of languages, Skype can help you do it all in real time – and break down language barriers with your friends, family, clients and colleagues. Our voice translator can currently translate conversations in 10 languages, including English, Spanish, French, German, Chinese (Mandarin), Italian, Portuguese (Brazilian), Arabic, and Russian. And our text translator is available in more than 60 languages for clear, seamless instant messaging. Of course, new languages are being added all the time, so if you don't see the language or dialect you need in our list of supported languages, keep checking back. In order to give you the best experience possible, Skype Translator uses machine learning – which means that the more you use it, the "smarter" it becomes, and the better your experience will be. And because you can get our online translator for your desktop, mobile device, tablet, Xbox, and your favorite wearables, you can use it whenever, wherever, and communicate more clearly (and in real time) at home, at the office – and everywhere in between. Note: For best results, when using our language translator, be sure to connect to your device using your favorite headphones and speak clearly. Is Skype Translator compatible with my OS? Skype Translator is available on devices with Windows 7 and above, as well as Mac OS X, iOS, Android, and Linux operating systems. For additional information on Skype, including details on how to get started, tips for calling and messaging, troubleshooting, privacy and security, and so much more, check out our Help page.